What am I bringing to the Cross today? A big steaming heap of anger. YES! I AM MAD AS HELL! This isn’t what we were promised! A twinkling of the eye and the entire world changed, many years ago. And the promises handed down from mouth to mouth, through books and street preachers and priests and mothers and nuns and fathers. Follow Jesus up to the Cross and everything will be All Right, Baby. Yeah, yeah, injustice in the world, riots in the streets of some far-off country, small children dying alone somewhere, that hurts. I can’t worry about that, though. Not when I’m barely holding on here, now, huddling against the darkness that threatens to enroach, the cold winds blowing around me bringing no sounds of life, anywhere. Metaphorically, of course. Anyone who looks over here at me sees a woman working hard, typing something important while listening to Neil Diamond on her iPod. What is there, though, out there for me? More importantly, what the hell am I doing here? And why, dear God, did you give me this hope? Because without this stupid thing called ‘hope’, I would so be able to just go on with a grey little life, here in the darkness, not expecting something better. I’d nurse these wounds and not cry out and complain about them, because I wouldn’t have this accursed hope that someday, somehow, it will be All Right, Baby. No, because of this stupid hope, I have to get up on my tired feet and stumble through this dark desert, groping around for the Light and Truth I know is somewhere out there. And then, today, I stumble up another hill, like all the others out here, and I squint through the dark, and keep climbing because it looks like there’s something up there. And there You are, looking down at me with sightless eyes as I’m looking up at You. I’ve got nowhere else to go. And my feet hurt. OH, COME ON! I just BARELY got to have Christmas, and was settling into Epiphany, and now I find I’ve only got 26 days until LENT?!!??!?!?! I call shenanigans! There, I’ve said it. 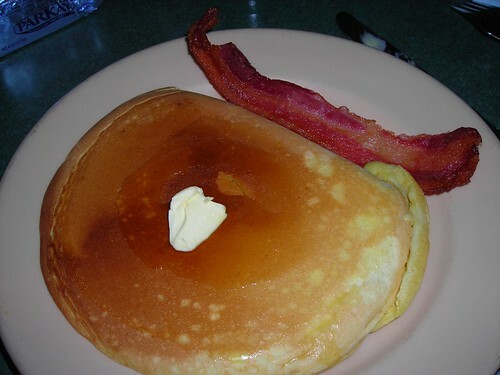 I’ll even say it again: I hate Lent, I hate it with the firey passion of a thousand suns. Now, I’m all for a season of penitence. I’m rather grateful for God’s grace and forgiveness, without which I have no idea where I’d be right now (but I ‘spect I’d be dead. It’s a long story, maybe I’ll tell you later). But by the boogers of the Sweet Baby Jesus, if someone refers to Lent as a ‘journey’ one more time, I’m going to call out the 82nd Division of the Little Old Churchlady Handbag Brigade to knock them about the head so hard that the word ‘journey’ itself is shaken loose. Journey, schmurny. You can’t run away from your sins, no matter how hard you try. They follow you everywhere, you wind up packing them along with your clean underwear. This is housekeeping time, people. Tie your hair up in a ‘do rag, get out the Dustbuster, and get to work. Don’t forget those corners where you like to pile things, like under beds and on top of your desk and in the closet (yeah, us faygelahs ain’t the only ones with closets, you know I’m right). Let the light in, open the windows, get a big garbage bag and a shovel if you have to, get help if you need it, dig out the mouldy bits under the bathroom sink. And get chopping, people! The Man Himself is coming soon! You’ve got to get ready! 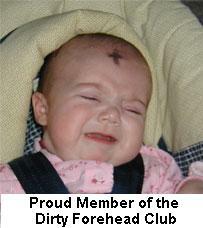 I have an Ash Wednesday tradition of making graphics for the Dirty Forehead Club. “What the hell is that?” You’re asking. Well, let me tell you. Many, many moons ago, when the earth was young and I wore dresses, I worked for an accountant. She was going through whatever it is really lapsed Roman Catholics do to get back in with the Church. Well, one day I came into the office and she kept holding her forehead. Worried that she had a migrane or something, I asked what was wrong. ETA: I’ll post a recipe later, but I’ve been fiddling with the layout of my page. Whaddya think? EATA: All graphics on this post are totally takeable. And, you know, if you have better manip skillz than I do, you can make your own, too… I’m looking at you, Rev. Madpriest! The signs are clear as day. People are talking about the good ol’ days of the ‘gesima Sundays. The Orthodoxen of my acquaintance are warming up with Cheesefare. The search term ‘Lent’ has been popping up in my statistics more frequently (along with ‘soundtrack shine jesus shine’, which just gives this Anglo-Catholic girl the shuddering horrors). A new, fun Gloria gets axed out of our choir folders because it’s ‘too upbeat’. My favorite coping mechanisim ever. Maybe, if we’re reeeeal quiet and don’t pay it any attention, Lent won’t come this year. Is Lent looking at us? Shhh, don’t look, don’tlookdon’tlookdon’tlook… are you looking? Don’t! But does it see us? Uh oh, I think it does. IT’S COMING! Quick! Get the Jedi mind tricks! These are not the Christians you are looking for, move along now. —Hallelujah, lyrics by Charles Wesley, music by William Walker, from the Sacred Harp songbook.